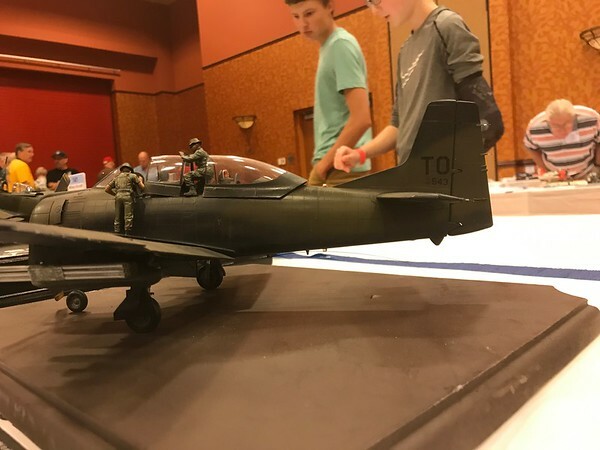 I've decided to join this GB with the Kitty Hawk T-28B/D. I'm going to build it as an AT-28D with the 606th Air Commando Squadron using AOA Decals, AMS resin bits and G-Factor landing gear. I'll be using a couple of build threads as references since there isn't much out there on the web for info. This will be my first Kitty Hawk kit. From what I've read, it's a very good one, and I look forward to building it. It is some good looking plastic! I've looked at the T28 a couple times but haven't pulled the trigger so I'll enjoy seeing what you do with it. Can't wait to see it. I did that scheme last year with Harold's resin goodies to help the cause. Unfortunately, most of the pics are gone, but here it is in Omaha. Check out Harold's seat armor, prop blades, wheels, air brake plug, gunsight, and mini gun pod. Aires is also coming out with an awesome full resin cockpit for it. Ernie your build is one of the reference's I'll be using for my build. Your enthusiasm for the aircraft and the kit plus reading up on the exploits of those courageous pilots persuaded me to purchase the kit and do this scheme. WRT to your WIP pics, I was able to use the PB fix and capture them. Your build looks awesome! Yes, I've picked up Harold's resin goodies for the build. 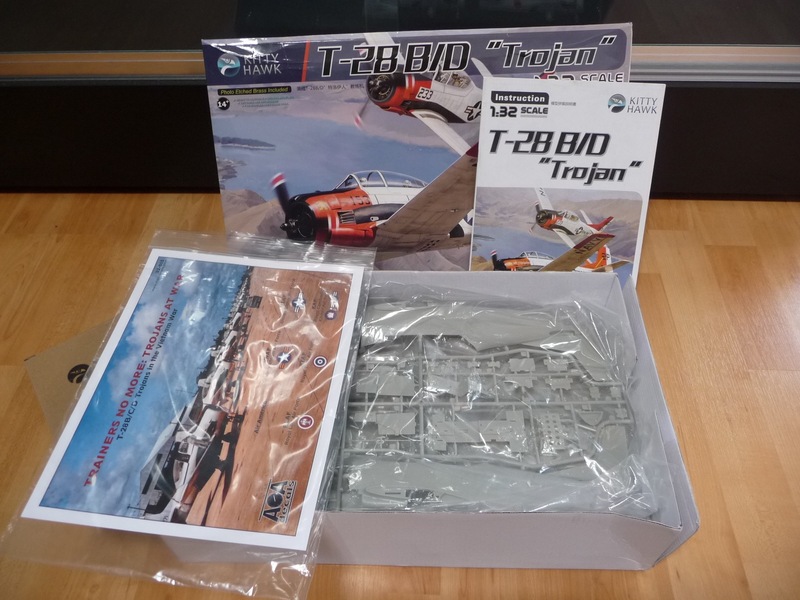 Look forward to the Aires pit for the next T-28 build! I've barely started this one, and I'm already looking to get two more to do a Laotian bird and a VNAF bird. I'll watch yours close, Mike. You'll blaze new trails, Im sure. There's plenty of room for improvement over what I did on mine, one being the sunshade. A few guys have succeeded with varying degrees of success in reproducing its look. My next one after the OOB C bird will be a converted SEA C.
I will be following this build as well Mike. I've got a T-28C and the AOA decal sheet that I plan on using to build a T-28D-5 as used by Laos. I've also received Harold's resin pieces. My problem is that I'm a bit fuzzy on the details of the Yankee Extraction system as installed in the T-28. I've been searching the net and have found a few photos so far but no clear shots of the cockpits. Good thing I enjoy a research challenge Enjoy your build ! Pictures of the T-28 Yankee seats are very hard to find. I must have downloaded hundreds of pictures over the last few years. many from the various Air Commando organizations that are or were in operation, and I've yet to find one definitive shop of the rocket mount. Then, good luck finding both seats, as usually it was the front pit that got pics taken of. It's surprising how LITTLE information is out there on the Special Operations Squadrons, especially in the early pre A-1 days of the AT-28D. There's plenty of ramp pics, several of aircraft in the air, but nothing of cockpit interiors. Maybe you'll find the Holy grail I've been looking for. scroll down to pg 50 (1-36 of the manual) to see a drawing of the rocket mount.Pg 48 and 49 describe it. Yup, I have that as well, but I'd love an actual picture of the installation. Remember that the real aircraft's control lock was in the front cockpit only. The kit has it in both, which is incorrect, so please eliminate the rear seat red lock handle. That is a pretty good drawing. It clears up many of my questions. Mike I hope you don't mind my questions about the yankee seat on your thread. I'm kind of excited that someone else is tackling the same subject but I certainly don't want to highjack your thread. I am looking forward to seeing your progress. Scroll down to pg 86 of the above manual to see a drawing of a pilot ready to use the extraction system. Hey who's the old fart in black back a couple rows? Ern is correct, its a really decent kit. Typical KHM misfires in places, but this time round they are fairly small, and Id say most any modeler w/average skills could correct. And probably me behind that somewhere. We were a gang for a week.